Oh fall how do I love thee? Let me count the ways...pumpkin pie, pumpkin bread, pumpkin seeds, pumpkin butter, pumpkin lattes, pumpkin ravioli, hot spiced *spiked* cider, walks with autumn foliage, Thanksgiving, pumpkin stew, pumpkin & cream cheese muffins....okay so it's pretty much everything pumpkin :-D. Love fall AND pumpkins! Did you know the pumpkin is a low calorie (just watch out for the added sugar in many pumpkin treats), high fiber food packed with Vitamin A, keeping your eyesight healthy and on top of THAT, it reduces bad cholesterol too? My strong feelings for this special orange ball of happiness led me on a quest to create a cozy, healthy and yummy fall breakfast dish featuring my beloved pumpkin as the star. As a fan of oatmeal for so many reasons (see below), I thought this would be the perfect food to spruce up with some pumpkin love! 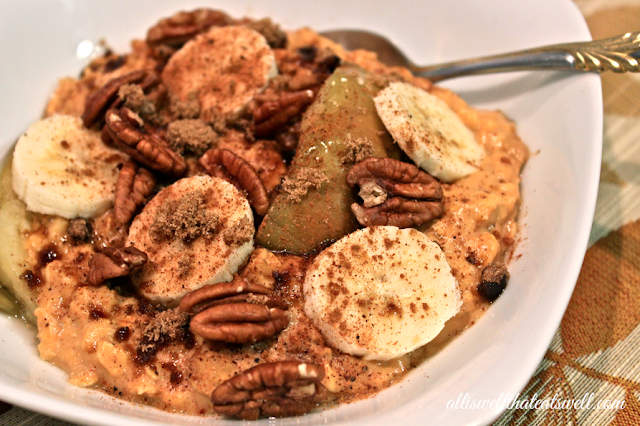 I experimented with my Pumpkin Harvest Oatmeal on my husband and mother first and they were hooked. Hoping you enjoy this simple, super nutritious and tasty power breakfast perfect for fall! 2. In a separate pot, heat oats and milk (and flaxseed if using) over high heat stirring intermittently for 4-5 minutes, then reduce heat to low, add pumpkin and about a teaspoon brown sugar and stir a few more minutes. Remove from heat. so yummy and cozy on a crisp fall morning!